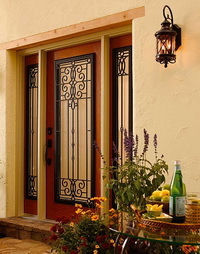 The charm of a wrought-iron veranda is recreated in this Old World-style door glass. 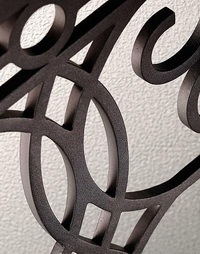 While its decorative scrollwork makes an elegant statement, Veranda's design is also practical. Its external grille is attached to a hinged frame, making opening and cleaning easy, and its low-E glass privacy panel increases your home's energy efficiency. Veranda offers a high level of privacy.